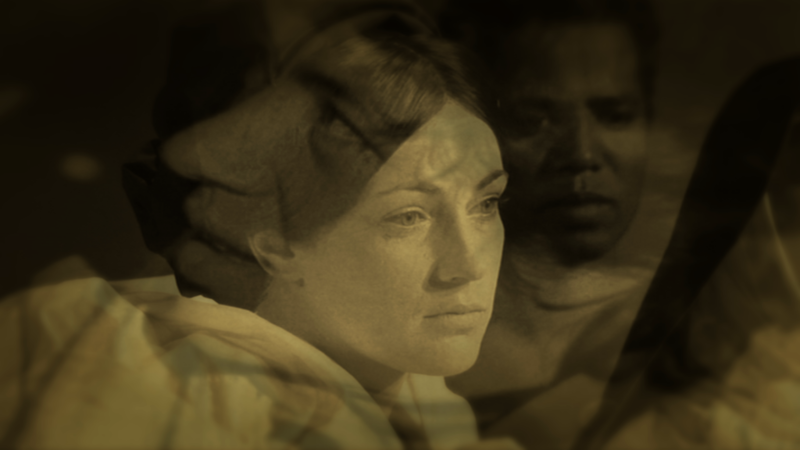 Two films will be screened during the conference, La Passione di Pasolini (2015, USA/Italy, 15’) by Hisham Bizri (Brown) and Pasolini’s Last Words (2012, USA, 61’) by Cathy Lee Crane (Ithaca College). 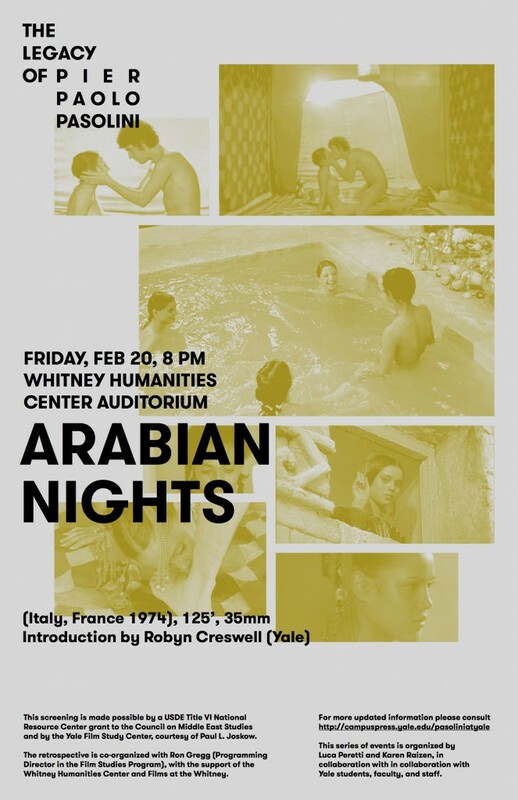 The program will start at 7.30, at the Whitney Humanities Center. La Passione di Pasolini by Hisham Bizri is a psalm for Pier Paolo Pasolini’s cinema, for his poetry, his Marxist politics, and for his shifting Catholicism. The psalm is ultimately a meditation on the Shakespeare’s idea that “All the world’s a stage”. We see the director Pasolini filming children enacting an old play, two actresses auditioning in a garden, the staging of the passion, and the funeral of Palmiro Togliatti, the long-time leader of the Italian Communist Party, among other changing faces of the world in relation to the reality behind it: the one-thing-next-another (juxtaposition) and the one-thing-after-another (succession). Pasolini’s Last Words by Cathy Lee Crane: combining staged and archival material, this elegiac essay considers Pasolini’s brutal murder in 1975 alongside the texts he published or left unfinished during his last year. For more information about this film, please read this interview/review. The screenings will be followed by a Q&A with both directors, moderated by Daniel Fairfax (Yale). This entry was posted in Uncategorized on March 1, 2015 by lp378. 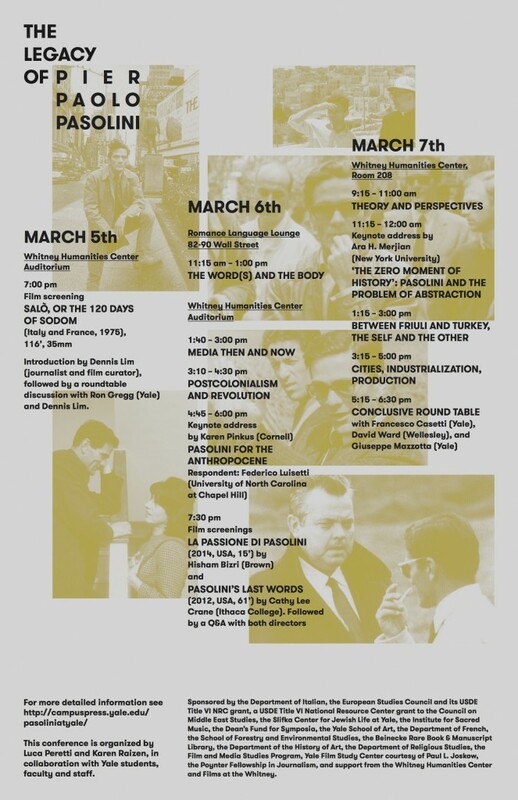 Before introducing and discussing Salò, or the 120 days of Sodom on March 5th, Dennis Lim will participate in an informal meeting organized with Yale Film Colloquium as part of their Curator’s Forum series. The meeting will take place on Thursday, March 5th, at 5:30pm, in WHC 208 and there will be a light dinner. If you would like to join us for this informal dinner and discussion with Dennis about his curatorial work (among other things) please RSVP to kirsty.dootson@yale.edu. Dennis Lim is the director of programming at the Film Society of Lincoln Center, where he also serves on the selection committee for the New York Film Festival, as the co-director of New Directors/New Films, and as co-curator of annual programs including Art of the Real and Projections. The film editor at The Village Voice from 2000-2006, and a regular contributor to The New York Times from 2006-2013, he has also written for Artforum, Cinema Scope, and The Los Angeles Times, among other publications. Currently a visiting lecturer in the Department of Visual and Environmental Studies at Harvard, he has also taught in the Cultural Reporting and Criticism graduate program at New York University’s Arthur L. Carter Journalism Institute. His book David Lynch: The Man From Another Place will be published by Amazon/New Harvest in 2015. This entry was posted in Uncategorized on February 28, 2015 by lp378. The last workshop leading to the conference will take place on Monday, February 23rd, 4pm, at the Beinecke Library, Room 39, it will be led by Anna Marra and it is co-organized with the Postwar Culture Working Group. There are three suggested readings. 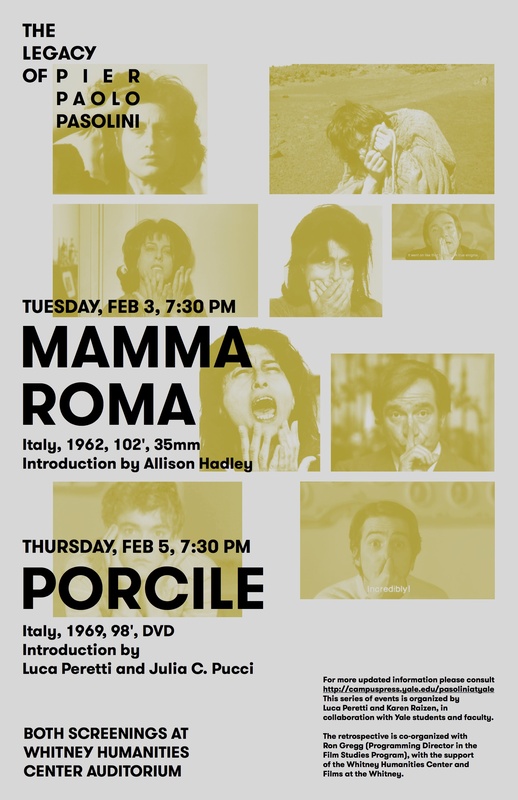 The first one is a short essay by Pasolini on the avant-garde, the second is a good introduction on the subject and the last pages talk specifically about Pasolini, and the third one is in Italian but very short. 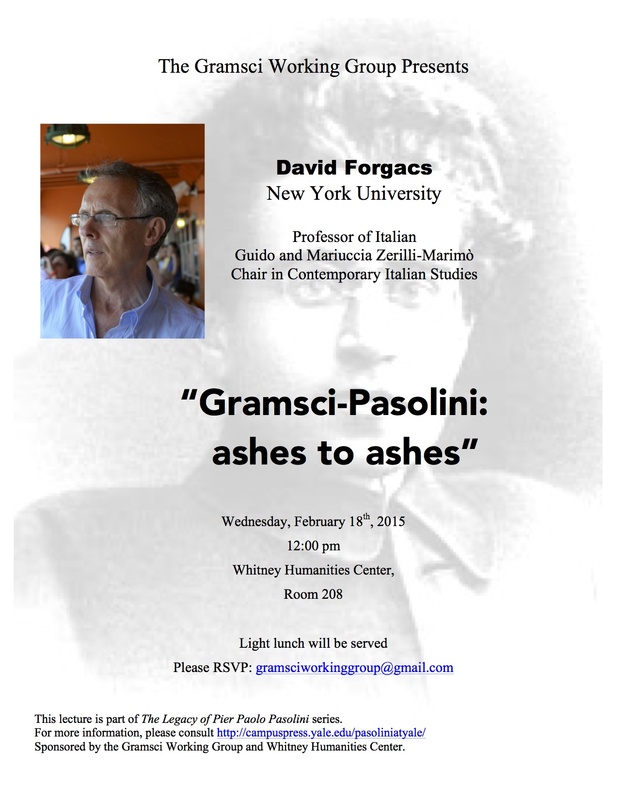 Please email us at pasoliniatyale@gmail.com if you wish to participate. This entry was posted in Uncategorized on February 20, 2015 by lp378. 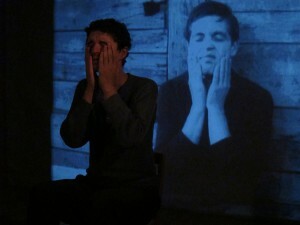 Please go to www.thelegacyofpasolini.net to see our new website with updated program and information, or click here. This entry was posted in Uncategorized on February 19, 2015 by lp378. This entry was posted in Uncategorized on February 18, 2015 by lp378. His main research area is Italian cultural and media history since 1800. His publications include Italian culture in the industrial era 1880-1980 (1990; also in an expanded edition in Italian, 2000), Mass culture and Italian society from Fascism to the Cold War (with Stephen Gundle, 2007, also in Italian), Italian cultural studies (with Robert Lumley, 1996), Rethinking Italian fascism: capitalism, populism, culture (1986), The Antonio Gramsci Reader (1998, 2000). On cinema his work includes studies of Antonioni (essays 2011, 2007, 2000), Pontecorvo (2007), Rossellini (2 books, 2000), popular cinema under Fascism (2002), migration in film (2001), memories of fascism in cinema of the 1960s and 70s (1998), as well as full-length commentaries on the DVDs of Ossessione, The Leopard, Red Desert and The Conformist. His latest book is Italy’s margins: social exclusion and nation formation since 1861 forthcoming from Cambridge University Press in 2014. This entry was posted in Uncategorized on February 10, 2015 by lp378. This entry was posted in Uncategorized on February 3, 2015 by lp378. This entry was posted in Uncategorized on January 19, 2015 by lp378. 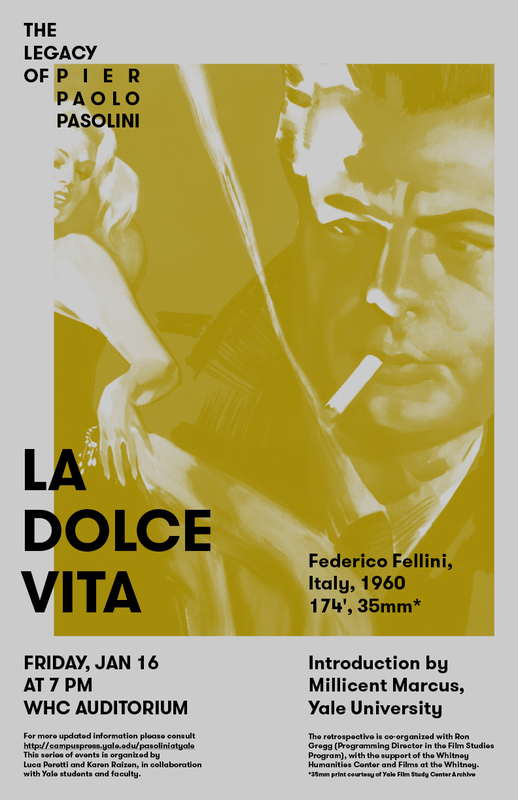 La Dolce Vita will be screened this Friday at 7pm at WHC Auditorium, introduced by Millicent Marcus (Yale). See the poster attached. 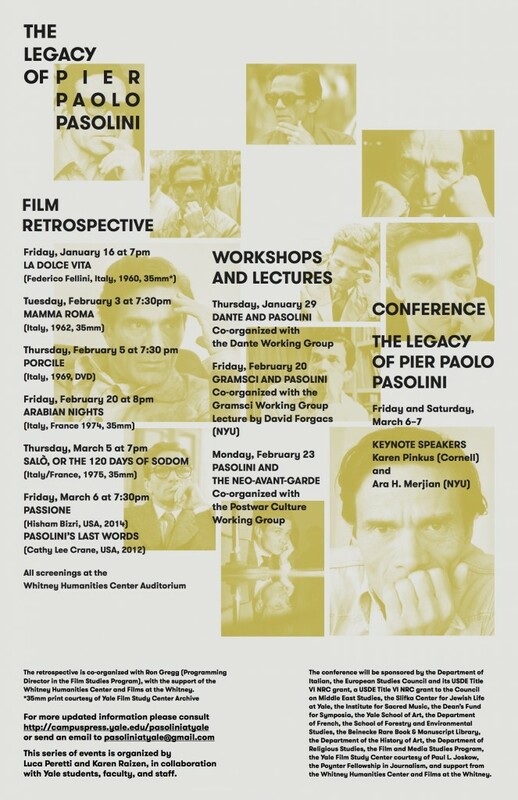 This is first event of “The Legacy of Pasolini – a conference and series of events on Pier Paolo Pasolini”. The screening is dedicated to the memory of Anita Ekberg (1931-2015). This entry was posted in Uncategorized on January 15, 2015 by lp378.